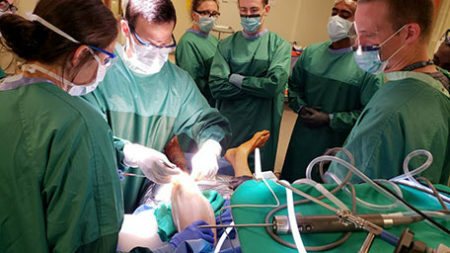 In the Department of Orthopaedic Surgery our mission is to be an academic leader in orthopaedic clinical care, innovative resident education, and musculoskeletal research. In the area of patient care, we strive to provide state-of-the-art, comprehensive but cost-effective care for all musculoskeletal disorders. Our education goals are to provide quality graduate orthopaedic education through a structured innovative teaching and evaluation process. Researchers in our department endeavor to make significant advances in musculoskeletal scientific knowledge and clinical practice through collaborative basic science, translational, and clinical research. Connor Woodle has a genetic disorder that resulted in him being born without thumbs, he now has all the dexterity he needs thanks to Dr. Bobby Chhabra, co-founder of the UVA Hand Center, who created thumbs for Connor over the course of two operations. The University of Virginia Department of Orthopaedic Surgery Residency Training Program offers excellent education, training, and research. With more than 70 years of proven history, UVA is established as a national and international leader in providing outstanding patient care, medical education, and musculoskeletal research. Cleo Boyd, a long-distance runner for UVA's Cross-Country team and Track & Field team struggled with a lingering injury. Boyd was operated on by Dr. Joseph Park, an orthopedic surgeon at UVA Health System. Since the procedure, Boyd has been able to consistently train and was part of the ACC Championship team in 2015. Lisa Black was on her way home from work when she was struck by a drunk driver. She was rushed to UVA Medical Center where she underwent several surgeries in the immediate hours following the crash. Lisa suffered fractures in her neck, back, ribs, hands, legs and knees – among other injuries. The 2017 Shen Resident Research Day will take place on June 23rd, 2017. The event will feature presentations by our Residents on a wide variety of orthopaedic and clinical topics. More information on the event and presentations will be provided after the 23rd. If, however you are a judge, and would like to review papers prior to the event, click the link below and input the password provided to you for access to them. In the interest of cultivating a collaborative research environment, the UVA Department of Orthopaedics has held an annual research retreat annually since 2015. The third annual Orthopaedic Research Retreat was held on April 8, 2017 at the Darden School of Business in Charlottesville, VA. Organized by UVA Orthopaedic's Dr. Quanjun Cui, the 2017 retreat featured outstanding lectures on regenerative rehabilitation, biomaterials, and current UVA clinical trials. Explore the many ways to help make Orthopaedic care at UVA even better.